Interior Design Inspiration: Colour In Nature 2019. Regardless of how aesthetically pleasing old arrangements are, entropy breaks down certain components of the home. You can’t make a time capsule out of a room. You can try, but the very furniture will begin to break down given long enough time; not to mention what happens to structures that remain hidden until corrosion can secure a strong foothold. Sometimes a cabinet hides a leak that fills the inside of a wall with mold. If you’re regularly remodeling, redecorating, and shifting the arrangement of your interior possessions, you can notice these things sooner. That’s not to say you should be continually redesigning your interior premises—that’ll just wear you out unnecessarily. It is to say that you want to redo your home’s insides at intervals. Remodel when it suits you—that’s a great way to keep property value constant, and even expand it. Add a deck to the backyard; there are DIY options out there. Throw a solar panel array on the roof. One that’s 3.2 kWh can be assembled and installed by an average man for around $5k. Depending on which state you’re in, that will yield between $10k and $20k in property value, as well as reduced utility cost, and even a tax break. Remodeling, redesigning, and upgrading your home can truly be profitable. Following, several additional interior design considerations will be explored, including 2019’s trend toward naturally-inspired chic, and the colors of the wild. 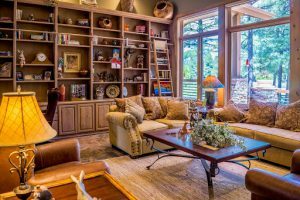 Determining Your Decorative Style—The Natural Component? New décor may incorporate the latest trends, and still be entirely your own. You can, for example, buy futuristic, Spartan furniture, but array it in a more Romantic sort of motif, complete with murals, chandeliers, potted plants, ornate lamps, paintings, and whatever else fits your decorative whim. Today’s color schemes can be made to fit any shad you like. What’s “in” right now is interior décor which is designed with a natural element informing colors, layout, and other factors. Now certainly, some décor may erode property value even if it fits your preferences. For example, a naturally-inspired basement room with actual dirt comprising the floor likely won’t impress a buyer or realtor; no matter how chic and modern other presentational aspects of the space are. However, color schemes which conform to natural transitions in the season, or elements of your local climate, can be very desirable. Also, floral patterns and fragrances can be perfectly appropriate. Your personal input arrives by way of your methodology in combining these things. There are options for just about anything you can dream up; budget will be your primary constraint. You need to find a balanced approach. For example, you might consider RTA cabinetry specified as per your vision for a room. RTA stands for Ready To Assemble. Going with ready to assemble kitchen cabinets online can help you design solutions that conform to your interior decoration preferences, and which yet function well while appearing up-scale. Solar panels were mentioned earlier, and represent a considerable means of increasing property value while reducing associated cost. This is part of a trend that is in some ways decorative at this point, but simultaneously utilitarian. That is to say: off-grid living. Installing energy solutions on the exterior of your property and premises make a lot of sense. Interior design can also be put to work making your home more sustainable. 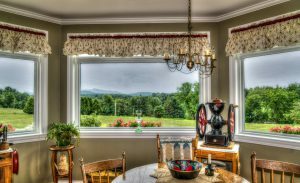 Windows and fabric can influence your homes energy, and configured to match seasonal patterns in terms of weather or color scheme. You can maximize energy utility while retaining sustainability and aesthetic. Consider the Internet of Things (IoT), and LED-lighting: room lighting in any color you want at the swipe of a screen. 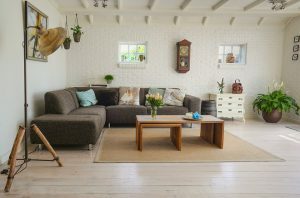 2019 will see more options like these on the horizon, and if you haven’t redecorated in a while, this year’s tech upgrades in combination with natural influences are certainly worth putting to task in your interior design efforts.